We took advantage of some beautiful Carolina blue sky and nice weather after a very windy couple of days — the changing of the seasons is becoming more evident — to do some planting in our newest garden, the White Garden. Specifically, we planted Spring blooming bulbs and now we are (well, Brigette is) going to find it very hard to wait out winter because we found some beautiful bulbs. Snowdrops, spring starflowers, white daffodils, fragrant giant white hyacinths and tall Ice Princess tulips will all be coming up in Spring of 2010. Plus, earlier this fall, we planted two types of white peonies and crisp white Joan Senior daylilies. 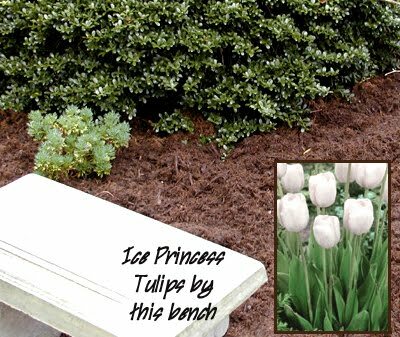 Below are photos of two sections of our White Garden taken this past weekend after the bulbs were planted and mulched over, along with photos we superimposed of the flowers that will be arriving in…OK, yes, Brigette is counting down…113 days. This photo shows a concrete bench that Dave made (white, of course!). We planted tulips next to it. Just to the right of those tulips out of frame is a white bleeding heart bush planted this past year. This area is along the walkway facing the north side of the Lake House where the Mountain Laurel Room is located. This photo shows our white butterfly bush in the middle (flowers in summer), and white yarrow (tiny little flowers in summertime) on the far right, with a dusty miller in the upper right corner. 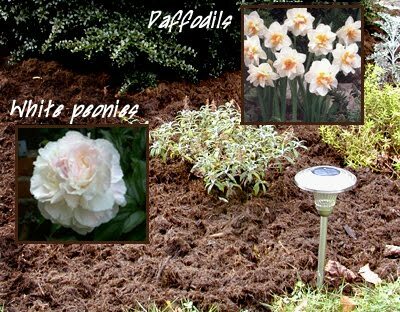 White daffodils with flame-colored centers and white peonies will contribute the springtime white blooms in this section. This part of the garden faces toward the Main House and the solarium. This entry was posted in Uncategorized and tagged flora and fauna by Inn on Mill Creek. Bookmark the permalink.